MANILA, Philippines – The August 2017 Physical Therapists (PT) and Occupational Therapists (OT) board exams results together with the list of passers, top 10 examinees, top performing schools and related announcements are available at this website as PRC officially released the results online two (2) working days after the last day of board examination. As announced, 802 out of 1,277 passed the Physical Therapist Licensure Examination and 215 out of 295 passed the Occupational Therapist Licensure Examination. The licensure exams are administered by PRC Board of Physical and Occupational Therapy headed by its chairman, Pollyana G. Escano and members, Raul G. Agustin, Bernadette M. Reyes, Delia R. Pabalan and Rolland Lyle D. Duque on August 5 & 6, 2017 at PRC testing centers in Manila, Baguio and Cebu. The schedule of online appointment for issuance of Professional ID and Certificate of Registration will be on August 15-16, 2017. According to the Commission’s Resolution No. 2016-1019 series of 2016 entitled “Schedule of Licensure Examination for Year 2017”, the target release date of August 2017 Physical Therapist and Occupational Therapist (PT-OT) board exams result will be in three (3) working days after the last day of board examinations or by August 9, 2017 (Wednesday). However, results may also be released earlier or later without prior notice. On the same board exams administered by PRC on February 2017, results were out after two (2) working days while three (3) working days on August 2016. During February 2017 of the same exams, 512 out of 856 passed the Physical Therapist and 128 out of 185 passed the Occupational Therapist. Angeles University Foundation ranked first in the PT top performing schools' list having 19 out of 19 examinees passed or 100% passing rate while University of the Philippines (UP) Manila topped the OT having all of its 18 examinees passed. Stephen Blaise Ilao Hernando from University of Perpetual Help System - Laguna topped the PT exams having 88.70% while Christine Joy Mirasol Delos Reyes from UP Manila ranked first in the OT garnering 81.60%. On August 2016 board exam, 846 out of 1,243 passed the Physical Therapist while 114 out of 229 passed the occupational therapist. James Michael Manansala Hernandez from Angeles University - Foundation topped the PT exams garnering 90.25% rating while Marjorie Ceniza Apron from Velez College topped the OT list having 82.00% rating. University of Santo Tomas (UST) and Cebu Doctor's University are the respective schools that topped in the aforesaid board exams. During February 2016 PT-OT exams, 521 out of 912 PT examinees passed while 55 out of 102 hurdled the OT. UP Diliman ranked first in the two board exams having all of its examinees passed. Anthony Palaran Acenas from Southwestern University topped the PT exams having 89.35% rating. In OT exams, Jay Allen Villon from UP Manila ranked first having 84.00% rating followed by Marinar Fe Latada from Davao Doctors College, Inc having 81.20%. 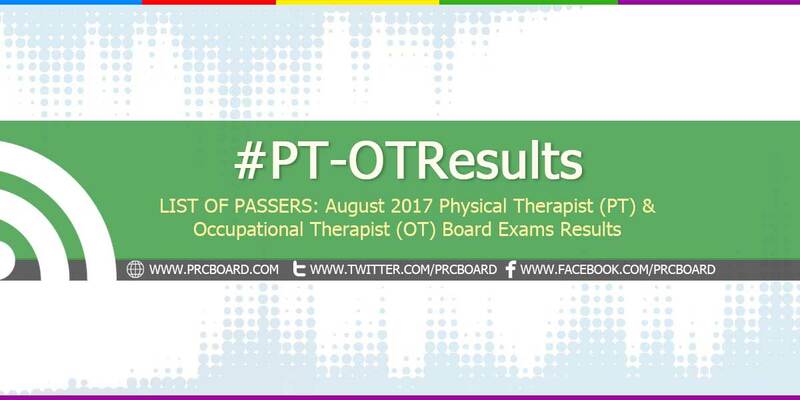 To receive up-to-date news about Physical Therapist and Occupational Therapist results for August 2017, we advise our visitors to bookmark this page, visit PRC official website or follow us at our social media pages via Facebook and Twitter. Matindi talaga ang PRC hindi pa ginawang 85% ang passing rate. Madami pa talaga silang binagsak. 5 years na nag aral tapos dumaan sa mga matitinding exams, reporting at mga trainings tapos dahil lang sa kapirasong lisensiya na hanggang pilipinas lang magagamit mauudlot pa ang kanilang hangaring makapagtrabaho at maiahon sa kaharapan ang pamilya tapos ganyan lang ang gagawin niyo. Kayo na ang professional.